If you like our produce and want to grow your own stop into our greenhouses for vegetable plants. We sell all the varieties that we grow in our fields as well as many more! Need help getting started? Click here for a few tips! All items may not be available every day. 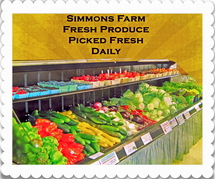 All our Simmons produce is picked fresh daily. This allows the produce to be harvested with the most taste and nutritional value possible. markets to check availability or if specific crop is needed.